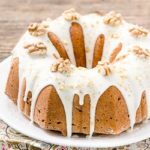 Bourbon Walnut Pound Cake is loaded with bourbon soaked walnuts, topped with a bourbon glaze, and sprinkled with toasted walnuts. Stir together chopped walnuts and bourbon in a small bowl. Allow nuts to soak in bourbon for 1 hour, stirring occasionally. Preheat oven to 350°F. Lightly grease and flour a 12-cup bundt pan. Cream butter and sugar in a large bowl until light. Add vanilla and beat to combine. Beat eggs in a medium bowl until they are thick and light. Add eggs to creamed mixture. Beat on low to combine then on high until mixture is thick and fluffy. Note at first the mixture will look curdled but it is not. Just keep beating and it will smooth out. Whisk together flour, baking powder, salt, cinnamon, and nutmeg. Add to wet ingredients and beat until just combined. Stir in bourbon-soaked walnuts. Pour batter into prepared pan. Spread batter so it is higher at the side and against the tube. Place a square of brown parchment paper on the pan to cover the cake. Cool cake in pan for 12 to 15 minutes. Remove cake from pan and cool completely on a wire rack. Pour glaze over cake, place walnut halves on top, and sprinkle chopped walnuts on glaze. Stir together confectioners sugar, cream, butter, bourbon, and salt. Add more cream, about 1 teaspoon at a time, until desired glaze consistency is reached.